0981973345 Tight binding. Clean unmarked text and covers. Almost like new. Earthlight Books is a family owned and operated, independent bookstore serving Walla Walla, Washington since 1973. 1611178134 Tight binding. Clean unmarked text and covers. Light soiling to edges. Almost like new. Earthlight Books is a family owned and operated, independent bookstore serving Walla Walla, Washington since 1973. 1629630411 Brand New; satisfaction guaranteed. Trade paperback binding. 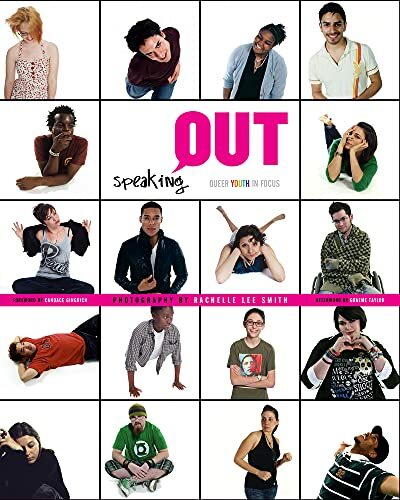 Speaking OUT: Queer Youth in Focus is a photographic essay that explores a wide spectrum of experiences told from the perspective of a diverse group of young people, ages fourteen to twenty-four, identifying as queer (i.e., lesbian, gay, bisexual, transgender, or questioning). Portraits are presented without judgment or stereotype by eliminating environmental influence with a stark white backdrop. This backdrop acts as a blank canvas, where each subject?s personal thoughts are handwritten onto the final photographic print. With more than sixty-five portraits photographed over a period of ten years, Speaking OUT provides rare insight into the passions, confusions, prejudices, joys, and sorrows felt by queer youth. Speaking OUT gives a voice to an underserved group of people that are seldom heard and often silenced. The collaboration of image and first-person narrative serves to provide an outlet, show support, create dialogue, and help those who struggle. It not only shows unity within the LGBTQ community, but also commonalities regardless of age, race, gender, and sexual orientation. With recent media attention and the success of initiatives such as the It Gets Better Project, resources for queer youth have grown. Still, a void exists which Speaking OUT directly addresses: this book is for youth, by youth. Speaking OUT is an award-winning, nationally and internationally shown and published body of work. These images have been published in magazines such as the Advocate, School Library Journal, Curve, Girlfriends, and Out, and showcased by the Human Rights Campaign, National Public Radio, Public Television, and the U.S. Department of Education. The work continues to show in galleries, universities, youth centers, and churches around the world.